In the Garden of Eden stood. Its fruit was not much good. And the apple made 'em sick! But Eve took a bite--Adam a jawful! An apple's the Cause of it all! And tries your pain to ease. It always fights to kill! Your agony is why the more it will frolic. 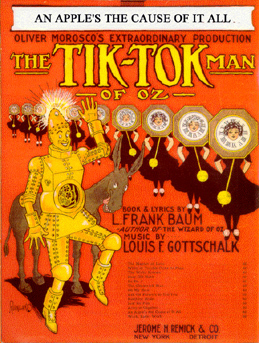 This song was sung by the Shaggy Man and a chorus of Rose Maidens early in the first act of Baum's 1913 Oz musical. Although this number is wonderfully addictive, it was later replaced by a song called "The Shaggy Man" which is not known to survive. You can download or play a MIDI of this delightfully catchy number; or you can download the sheet music in PDF format which will allow you to save it on disc or print copies for yourself. Orchestration Copyright © 2001, James Patrick Doyle.